All transactions are safe and secure with a reliable history in online purchasing behind each of our associates. 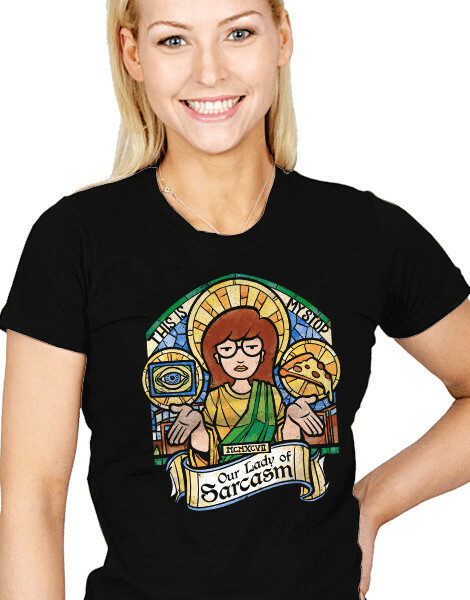 Buy the Our Lady of Sarcasm Daria t-shirt to own Daria clothing and merchandise. La, la, la, la, la...la, la, la, la la. That theme song is what comes to mind when I look at this Daria t-shirt. This design features Our Lady of Sarcasm. After all, she somewhat religiously states her views on life, and we all know, she hated everything before it was cool to do so. Pick from a selection of colors and styles to make it all your own. Take a moment to peruse the DVDs, including the Daria Is It College Yet and Daria Is It Fall Yet movies. In addition to the Our Lady of Sarcasm Daria tee above, browse the Daria Clothing Gallery for more apparel like men's and women's clothes, kids shirts or hoodies.